Retail Price $139.99 0 0 Like this product? It is highly accurate map data and turn-by-turn directions that sound as if spoken by a friend. Also it guides you to the correct lane for an approaching turn or exit, making unfamiliar intersections and exits easy to navigate. A speed limit indicator shows you how fast you can go on most major roads. With its emergency locator, you always know your location. The speed limit indicator of this Garmin GPS with lifetime map updates shows you how fast you can go on most major roads. With its "Where Am I?" emergency locator, you will know where your exact location is. The voice prompt GPS also comes preloaded with more than 8 million points of interest and offers the ability to add more places. With a big 5″ (12.7 cm) touchscreen, more than 5 million points of interest (POIs) and spoken turn-by-turn directions, nüvi 50 makes driving fun again. 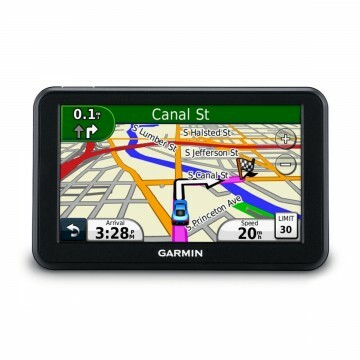 A best traffic solution offered by Garmin for three good reasons: it’s fast. HD Digital Traffic receives updates up to every 30 seconds. It’s free. No distracting advertising and no subscription fees. And, HD Digital Traffic covers more area, including interstates, highways, secondary streets. Brightly colored arrows indicate the proper lane position needed for your next turn, to ease the stress of merging on or off a roadway. Navigate confidently through interchanges, even those you’ve never driven before. PhotoReal junction view offers realistic displays of junctions and interchanges along your route, including road signs and the surrounding landscape. Bird’s Eye junction view provides a detailed view of interchanges, looking down from overhead. When equipped with voice activated navigation, nüvi is able to respond intelligently to your spoken commands. Just talk to it. Your hands can remain safely on the wheel. - Trip computer records mileage, max speed, total time and more.